Getting back to the point…last year my dad spent months raving about a book, The Shopkeeper by James D. Best. He wanted me to read it; I was not interested. I was even less interested when he told me it was a western. I don’t do westerns. He had somehow convinced my mom, a fellow lover of fine literature, to read it and she told me it was surprisingly excellent. I agreed to give it a shot—if only to get the two of them off my back. It turns out, dear readers, there are problems with book snobbery. As with Harry Potter, the case of The Shopkeeper revealed a grave error in my prejudgment. While the plot of this western may sound trite, Steve Dancy, a well educated New Yorker heads to the wild west where he faces pistol duels and a gang of outlaws, it is anything but. This novel is not only entertaining, but clever, and quite intriguing. The prose is decidedly and artfully simply, and I’d argue that the story reveals itself more like a detective novel than a typical western. To be truthful, the narrator, Dancy, had me in Chapter 2 when he confesses to “dawdle over breakfast.” He takes his time, enjoying a large meal—eggs, biscuits, bacon, and coffee– all while reading a good novel, in this case, “The Adventures of Tom Sawyer, a new book by Mark Twain.” We’ve said it before, we’ll say it again: food and books are a perfect combination. Steve Dancy just gets us. Another great combo, cheddar and chives. 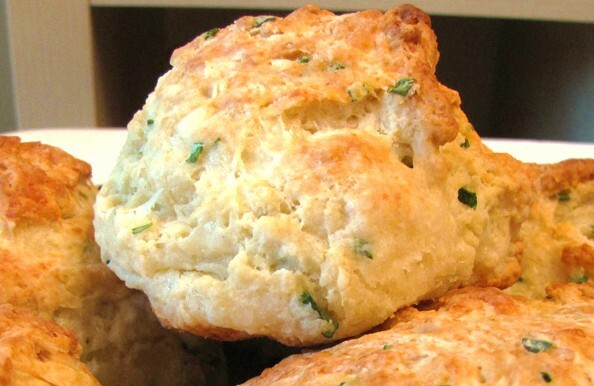 These cheddar and chive biscuits are the perfect complement to a savory breakfast and they also make a great side dish at dinner too. Because they include a bit of dry ranch dressing mix, they definitely have a bit of western flavor. Enjoy! In a large mixing bowl, combine self-rising flour, minced chives, salt, pepper, and ranch mix. Work in the shortening with a fork (or fingertips) until there are no large clumps. Stir in shredded cheese. In a separate bowl, whisk together Dijon mustard and heavy cream. Make a well in the center of the flour mixture and pour in the cream mixture. Add ¾ of the buttermilk. Gently stir to combine. The dough should resemble cottage cheese. If it is drier, add more buttermilk. If it is soupy, add a small additional amount of self-rising flour. Spread the all-purpose flour on a plate. Flour your hands to make the dough easier to handle, then, one at a time, spoon evenly sized dough balls onto the plate of all-purpose flour. Sprinkle flour all over the ball of dough. Shake off any excess flour and place it in the prepared cake pan. Continue shaping the biscuits and pack them tightly against one another in the pan until all the dough is used. Place the pan in the oven on a shelf just slightly below the center of the oven. Bake 20-35 minutes or until lightly browned. Brush with melted butter and invert onto a plate and then back to another so top side of biscuits is facing up. Cut between biscuits to make them easy to serve. This entry was posted in Books, Breads, Breakfast, Holiday dishes, Lowcountry, Side dishes, The Shopkeeper, Vegetarian and tagged biscuit recipe, biscuits, book review, cheddar and chive biscuit recipe, classic books, harry potter, how to make biscuits, james d. best, the shopkeeper by james d. best, western books. Bookmark the permalink. Those biscuits look delicious! I’m sorry about your Krispy Kreme decision. Though I prefer Dunkin Donuts–a custard filled KK donut is quite a treat! I wonder, though, if your issue isn’t so much with the company, but with the donuts themselves! Oh, it’s the company. I’ll eat a dunkin donuts brand donut (if it’s plain cake, preferably stale. yum.) I remember when they opened in Oregon people camped out (did you read that?! CAMPED!) outside the stores for weeks to be first in line to eat these silly donuts. And before they opened, the news reported people paying hundreds (hundreds!!) of dollars to get their hands on a box of Krispy Kremes that someone had smuggled in. Really people? Really? !